Those of us who were born to Depression and World War II Veteran parents grew up hearing about the Depression and War years. Our parents all wanted us to have a better opportunity. In later years, in my law practice and probating estates, it was obvious that persons of the Depression era saved money and lived modestly. They guarded their privacy about their savings and worried about �old age� income needs. I was born in October, 1940, more than a year before the United States was attacked at Pearl Harbor and the United States entry into the World War against Japan, Germany and Italy. World War II lasted until August 15, 1945, so I do remember tidbits and fragments from that period. Since the Dawson family mostly farmed, the younger sons received agriculture exemptions. Uncle Ralph Dawson did serve in the Army. 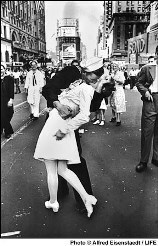 I do remember comings and goings of the service members and hearing conversations and radio broadcasts about the war. On my mother’s side of the family, Uncles Belvy Terry, Leon Terry, Harold McAfee (Evelyn) and Clifford Bloodworth (Hazel) served. 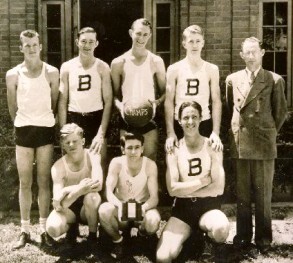 Leon (Snooks) Terry graduated from Bogart High School in 1941. Snooks was a close High School friend of Vance Daniell, Uncle DeWitt Daniell’s son and first cousin of my father. Vance died during WW II and made an impression on all family members.Aunt Becky remembers Mama Hassie coming to the field off Daniell’s Bridge Road to tell them of her nephew’s death. S.Sgt. 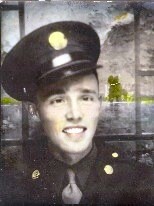 Roy Vance Daniell, of Bogart, Georgia, served in the 242nd Infantry, 42nd Division (known as the Rainbow Division) and was killed in Germany on April 4, 1945. A military funeral was held at Union Church cemetery.Vance’s remains were later moved to Evergreen Cemetery where other family members are interred. Uncle Harold McAfee was retired from the Navy and he and Aunt Evelyn lived at East Point and shopped at Fort McPherson , U.S. Army post located in East Point, Georgia. With three maternal uncles and one paternal uncle serving during that era, I heard the term “Fort Mac” a lot in my youth. A neighbor from Watkinsville, Durham K. Butler (Butler’s Crossing) served in North African Theatre - Italy and was captured by German Troops on January 21, 1944. I later worked with Durham at the Experiment Station and heard him talk about working in fields and treatment by the German Captors. Durham was very much respected for surviving the ordeal. 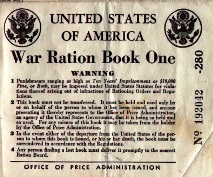 World War II rationing was in effect. 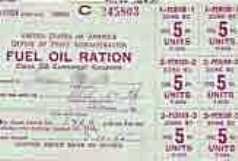 I remember that ration coupons and tokens were important during the War.To buy gas, tires and other rationed commodities, one needed coupons and tokens. 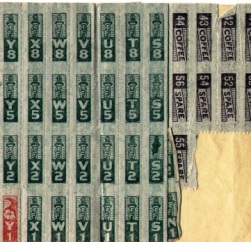 My family would exchange milk, butter, eggs and other farm products for ration coupons at Hamilton’s grocery and others in the Cord Mill area of Athens-Clarke County. The Athens area had a military presence during WW II.During World War II, the U.S. Navy built new buildings and paved runways to serve as a training facility for naval pilots. During World War II, Athens was named as one of only five naval preflight schools in the nation. Thousands of young military men filled the city while the navy helped build several new buildings and recreational facilities on campus and give the airport its first paved runways. While I was not quite five years old when the war ended on V-J Day on August 15, 1945, I do remember seeing soldiers and other activities in the Athens area. I have a glimmer of memory of riding with my father in the area around Lumpkin St at Broad and seeing soldiers marching in formation. It is my earliest memory of hearing the term “Japs”. I am sure Daddy was explaining the Japanese involvement in the war. After the War, appliances, automobiles etc became available.During the War, we had an Ice Box to refrigerate our food. The Ice Man came on a regular basis. 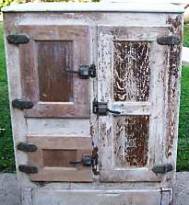 Not long after the war, I remember Carl Maxey, who worked at Sterchi’s, delivered a new refrigerator on his pickup truck.He backed up to the porch of the old house (near Aunt Becky’s house now). He had several refrigerators on that truck. If I remember right, Mama Hassie, Uncle Raymond and Aunt Patt and possibly Otho and Julia Lord had one delivered about the same time. That refrigerator served us well for decades. It was rusty but still was running on the back porch of the ole Home Place when Mama died in July 1998. Those of us who were born to Depression and World War II Veteran parents grew up hearing about the Depression and War years. Our parents all wanted us to have a better opportunity. In later years, in my law practice and probating estates, it was obvious that persons of the Depression era saved money and lived modestly. They guarded their privacy about their savings and worried about “old age” income needs. From the experiences of our youth and hearing our parents describe the era, we learned habits of working, dependability, honesty, loyalty and patriotism. Things have changed during our life times but not necessarily for the better.